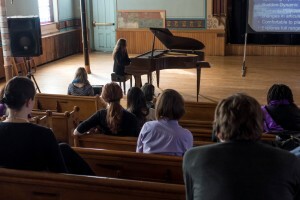 The WCForum features lectures and lecture-recitals on women composers and related topics. Presentations are 20-25 minutes in length, plus time for questions. A full schedule of talks with abstracts is given below. Please join us to learn more about these great topics! Although a French composer by birth, the art songs of Pauline Viardot (1821-1910) reflect an eclectic array of styles found throughout Western and Eastern Europe. While many of her contemporaries were involved in advancing the genre of nineteenth-century song literature, Viardot was one of the few composers writing in a variety of national styles. Viardot, who was fluent in several languages, composed songs in Russian, Spanish, French, German, and Italian. A fascinating figure, Viardot was an accomplished singer, a composer, a teacher, and a bona fide polyglot. On her extensive travels, she was exposed to assorted contrasting musical styles, cultural traditions and foreign languages. In the tradition of nineteenth-century exoticism, Viardot incorporated diverse national styles into her art song compositions. The use of dance forms, folklore, text settings, and imaginative piano accompaniments are some examples of devices Viardot employed to portray national style and cultural uniqueness. This lecture-recital will focus on the influence of national styles in her compositions and showcase art songs in a variety of languages. Mana-Zucca enjoyed a nearly century-long career as pianist, musical comedy star, composer and patron of the arts. This lecture-performance will feature piano compositions written during various periods of the composer’s life; they represent excellent craftsmanship in the handling of small and large forms, and contain lush, chromatic harmonies. The program will include: Fugato-Humoresque – dedicated to Edwin Franco Goldman, on whose concert series the orchestral version was performed; Bolero de Concert dedicated to none other than Artur Rubinstein; Valse Brillante and Zoaves’ Drill, which in orchestral arrangements were performed on the famous 1924 Paul Whiteman orchestra concert which also featured Gershwin’s Rhapsody in Blue; as well as other short character pieces and the first Piano Sonata. These rewarding works merit rediscovery and a wider audience. Hailed by The New York Times as “striking and resourceful…handsomely brooding,” Hannah Lash’s music has been performed worldwide with commissions from The Fromm Foundation, The Naumburg Foundation, The Boston Symphony Chamber Players, Alabama Symphony Orchestra, Los Angeles Chamber Orchestra, Carnegie Hall, Orchestra of the Swan, and Talujon Percussion, among others. Lashhas received numerous honors and prizes, including a Charles Ives Scholarship from the American Academy of Arts and Letters, a fellowship from Yaddo Artist Colony, the Naumburg Prize, the Barnard Rogers Prize, and the Bernard and Rose Sernoffsky Prize in Composition. Lash obtained her Ph.D in Composition from Harvard University in 2010. She has held teaching positions at Harvard University, Alfred University, and currently serves on the composition faculty at Yale University School of Music.